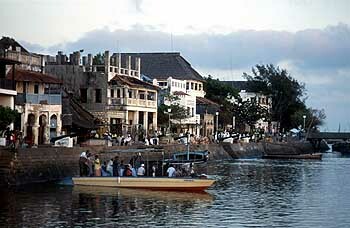 A truly unique place, Lamu is a town unaffected by the passage of time...; Lamu is a romantic town that has survived time without undergoing changes, a place where things are today almost as they were at the turn of the Century. An exotic getaway for visitors, where donkeys are used for transport. The streets are narrow and winding. There are probably more dhows to be seen here than anywhere else along the East African Coast. The beach is magnificent and uncluttered. It�s one of the most relaxing places you will ever have the pleasure to visit. The perfect place for honeymooners and couples. A schedule light aircraft to Manda Island. Boat transfer to your overnight hotel, Lamu Island Hotel/Stone Town House/Peponi Hotel/Kijani House, D.
Full day leisure tour of Lamu island with a visit to the museum through the alleys. A chance to see very old mosques and the architect of the famous Lamu doors. Overnight stay at Lamu Island Hotel/Stone Town House/Peponi Hotel/Kijani House, B,D. Afternoon scheduled light aircraft back to Nairobi to arrive in the early evening, B. To reserve the above itinerary and for available packages, please contact us.